Have you watched the movie of “Avengers: Infinity War”?. The movie has a sad ending with Thanos finally succeed of wiping a half of human population. From the graphical aspect, you will see a bunch of stunning effects from the movie. One of which is on end section after Thanos snapping his fingers. People affected the spell disintegrate like dust. 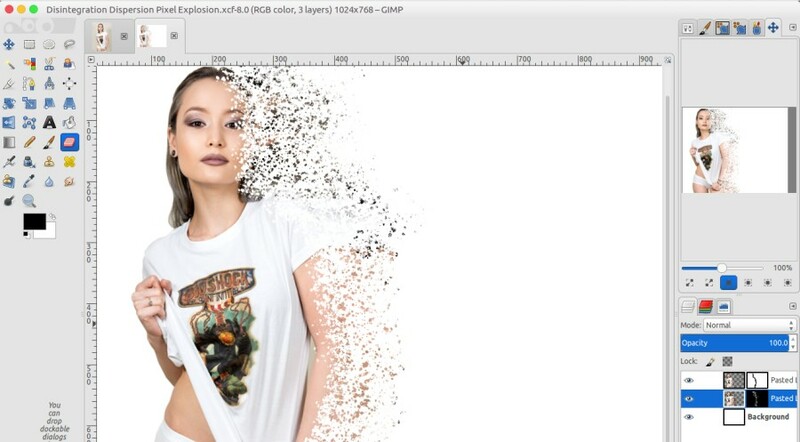 In this tutorial, I am going to demonstrate how to create a disintegration effect like that one. I am going to use a photo of a woman as the example. You can definitely you use any image, but if you want to use the same image as me you can download the photo which I include on end section of this tutorial. First and foremost, launch GIMP on your computer and open the image you want to apply the disintegration effect to. You can use the Paths Tool to make the selection. This process can take some time. Don’t forget to zoom-in the image to get a more detailed selection. Following the demonstration of the selection process. Once you are done with the selection process, go to Select -> From Path and go to Edit -> Cut. The next step, you need to create a new image with a white background and paste the object you have cut to it. To do so, go to File -> New. One thing, use a landscape orientation when creating a new image. A 1024×768 image would be nice. Once you create a new image with a white background, go to Edit-> Paste as -> New Layer. For the rest of this tutorial, you will work on the tab of the new image you have just created so you can close the previous tab if you want. Before stepping further to create the disintegration effect, use Scale Tool and Move Tool to set the scale and position of the object. Place it to the left or right of the canvas like the following. Once you are done scaling the image and setting its position, go to Layer -> Layer to Image Size. This is the main section of this tutorial. Follow the steps below to apply the disintegration effect. Duplicate the clipboard layer. To do so, select the clipboard layer and go to Layer -> Duplicate Layer. Move the duplicated layer below the clipboard layer. Select the duplicated layer and go to Filters -> Distorts -> IWarp. 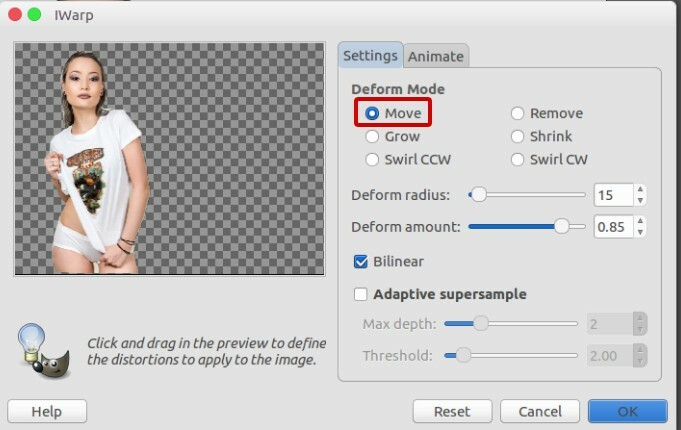 On the appearing pop-up dialog menu, select Move on the Deform Mode section under the Settings tab. Use your muse to create a displace effect of the object. You can enlarge the pop-up window to ease your job. Just be careful during this process since the undo button (CTRL+Z) is not applicable. 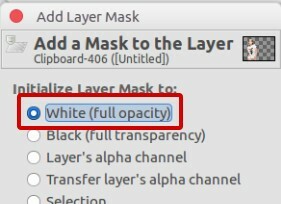 Add a layer mask to the duplicated layer by going to Layer -> Mask -> Add Layer Mask. Select Black (full transparency) on the appearing pop-up dialog. 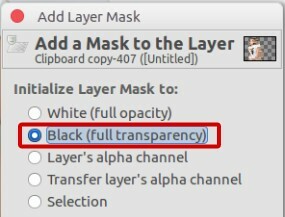 Add a layer mark to the clipboard layer by going to Layer -> Mask -> Add Layer Mask. Select White (full opacity) on the appearing pop-up dialog. Select the clipboard layer and click the Paintbrush Tool on the Toolbox panel and set the brush type to “Splats 01”. Make sure the foreground is black. With the Paintbrush Tool selected, brush the edge region of the object. Select the duplicated layer and change the foreground to white. With the Paintbrush Tool selected, brush the region next to the object. For the final step, set the foreground back to black and brush once again the region next to the object to get smoother dust. Done! Following is example of the disintegration effect I created.